The First Presbyterian Church is located in the small, but charming community of Bridgeport, Nebraska. While the church is small and may not appear to be of any significant extravagance in terms of its architecture from the exterior, inside it holds a hidden treasure. Though difficult to see from the outside of the church, upon entering one’s eye is immediately pulled to the bright color and attractive designs of several ornate and expertly crafted stained glass windows. 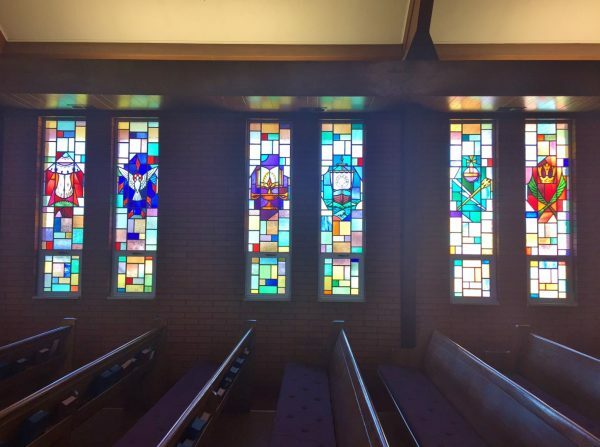 It is these windows that make the church a true hidden gem in this small Nebraska town and are beloved by both its members and the local community. Sadly, one day, misfortune fell upon the church and several of the stained glass windows were damaged by a severe hailstorm. Not only was the glass broken in several areas, but the aluminum bead glazing beads on the exterior were also dented badly. The church is over 60 years old and this was the first time it had ever suffered hail damage. The members of the church contacted our company to see what could be done about the damage. After seeing photographs of the damaged stained glass, we decided to take a trip to Bridgeport so we could inspect the windows in person. When we arrived, we were impressed by the beauty of the stained glass and were determined to do all we could to preserve it and restore it to its original appearance. We devised a plan that would act as both a solution for the church and would also be acceptable to their insurance company. Our plan would allow the restoration to be completed on site without removing the windows. We obtained samples of the glass that we would need for the repairs and then went back to our studio to match the glass with pieces from our stock inventory. 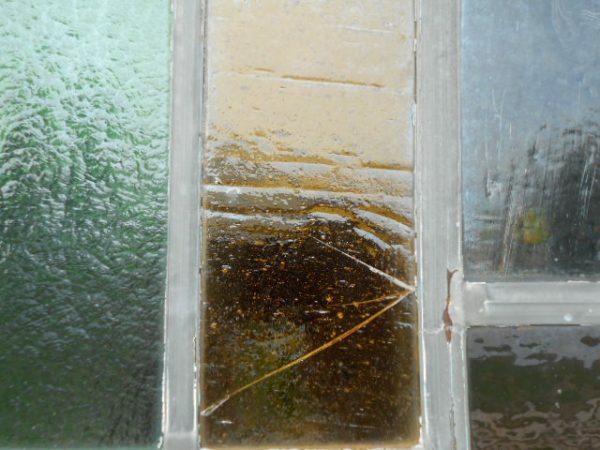 We then brought this glass back with us to complete the repairs on site. The damaged glass was removed and replaced with matching glass. We also removed the dented aluminum glazing beads and replaced them with a new glazing bead that was slightly narrower in profile. 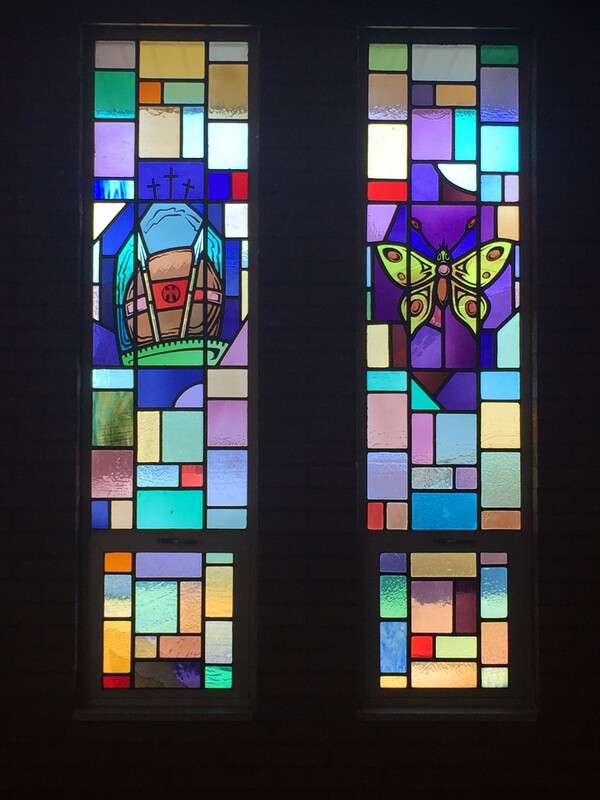 After the restoration was complete, we also installed ¼ inch thick tempered safety over the windows to protect the newly restored stained glass and prevent it from being damaged again in the future by another storm or other unexpected event. 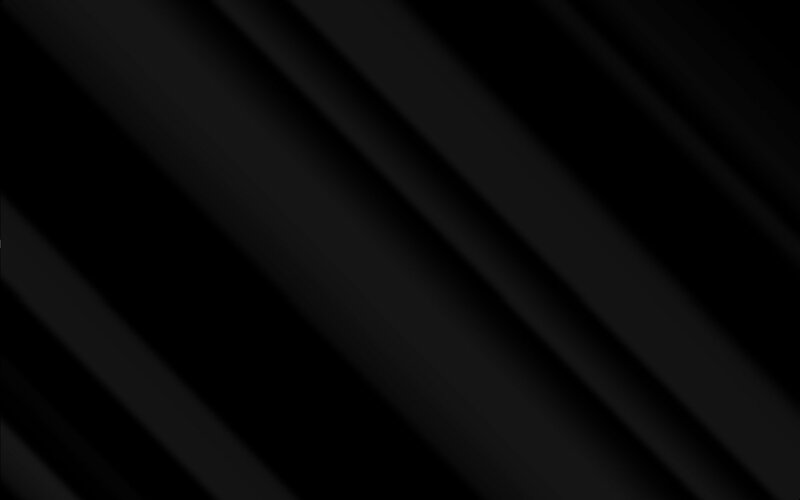 We were extremely satisfied with the results of this project. Not only did the stained glass look just as beautiful as it did before the damage, but it would also be protected from the elements so the church could enjoy the windows for several decades longer.